One of the major financial milestones you are likely looking forward to is retirement. However, a successful retirement — how ever you choose to define it — is not likely to just happen. 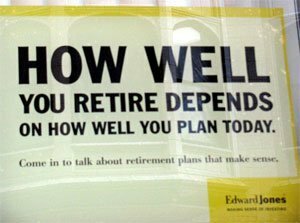 You will need a plan in order to reach your retirement goals. To help you better plan for your retirement, here are 6 factors to consider. As you plan for retirement, you will need a plan to reduce your debt by as much as possible. Debt obligations represent a drain on your income. Plus, you are paying interest to someone else, rather than using the money for your benefit. Before retirement, do your best to pay down your debt — including your mortgage debt. The fewer encumbrances you have for your money, the more likely you are to enjoy a successful retirement. You will still need some income of while you are in retirement. Many people think about this in terms of saving up a large enough nest egg in some sort of investment account that makes it possible for regular withdrawals without overly depleting the capital. However, this is not the only way to plan for regular income during retirement. You can start now to cultivate income streams from web sites, a business, royalties, or other sources. Consider your monthly needs, and how you can meet them. We don’t like to think that there may come a time when we are incapacitated, but it could happen. And it may be that you need to spend some time in a long-term care facility, such as an assisted living community or a nursing home. If that is the case, your money may not go as far as you would like. Carefully consider how much you might need to take care of long-term arrangements, and consider your options. In some cases, certain annuities and long-term care insurance policies can work well. However, it is important to carefully read the terms of these contracts, since not all annuities and long-term care policies are the same. Not only should you consider your money situation leading up to retirement, and during retirement, but you should also think about what happens after you pass on. Unless you don’t care what happens to your estate, and what sorts of expenses and taxes your heirs will be saddled with, estate planning is a good idea. Figure out what you want to have happen to your estate, and whether there is some way to protect your assets as much as possible. You might also need to consider what happens to a spouse or other dependent, and make arrangements to cover a shortfall in pension payments or other income when you pass on. A good attorney can help you sort out your options. This last factor doesn’t have much to do with money, but it is quite important. Few people plan for a lonely retirement. Consider your friends and family, and your social options. Now is a good time to cultivate relationships that can last through retirement, and that can provide you with a support system and social interaction. If you have a life partner, it is important to continue developing that relationship now, so that you can enjoy retirement together. Social interaction can help keep you happy, as well as positively affect the health of your mind and your body. As you work toward your retirement, you might need some help with planning. Make sure that you do some research ahead of time, though, and consider your needs. Choose help that is experienced, qualified and capable. A financial professional, or a legal professional, can help you get your affairs in order and help you create a plan that will see you through retirement. Will You Have Enough for a Comfortable Retirement? Estate planning is one topic that a lot of people should be educated. Lot’s of average American’s are not comfortable discussing this matter. However this is very important and should be included in everyone’s agenda. Estate planning is not for the rich and millionaires anymore. Planning for retirement requires forward thinking. One of the biggest expenses that’s often missed is healthcare. How much will your insurance cost? How much are prescriptions? Taking the time to plan for these costs and the common living expenses (rent, mortgage etc.) positions you better to enjoy your retirement. Who are you supporting? Sick husband/wife? Children? Grandchildren?